Depeshe established in 1985 by Kjeld Schiotz in Hamburg, today Depesche employs around 350 people and is counted amongst Europe's leading suppliers of greetings card and gifts. Since 1990 the distributon of trend products, became the main focus of Depeshes activities. Depesche products include the Top Model range, which is a firm favourite with Rhubarb Toys shoppers. House of Marbles at Bovey Tracey is a working glass and games factory set in an historic pottery. They have been manufacturing their unusual range of traditional games, puzzles, toys, marbles and glassware for many years. 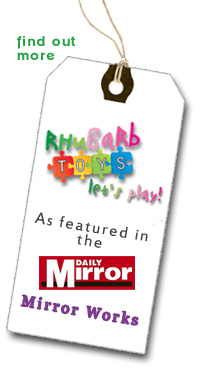 Rhubarb Toys loves working with House of Marbles as they have some great ideas of games and toys to amuse all ages. Insect Lore was founded in California's San Joaquin Valley by Carlos White, an entomologist. He had an idea to create a kit through which people of all ages could witness the metamorphosis of a real, live butterfly. Today, more than 30 years later, Insect Lore also offers ants, ladybugs, silkworms and worms, frogs, and other living science experiments. Lanka Kade translates as 'the Sri Lankan shop' and was set up in 1994 by husband and wife team Upul and Diane, with the aim of providing an outlet for items produced by small craft enterprises in Sri Lanka. Lanka Kade has developed a product range of educational toys and gifts for young children. All of their products are handmade by seven family based enterprises with whom Lanka Kade has long term working commitments. Rachel Ellen Designs are independent greetings card and stationery designers established in 1997 and based in a Victorian print factory in Nottingham, UK. Rachel who was previously a professional ballet dancer, started the company hand painting cards literally from the kitchen table in her London apartment. From small beginnings and with massive help from Rachel's parents (Barrie and Jan) and now 25 staff members, Rachel Ellen has become a thriving, successful business. The In Thing is the UK's premier specialist pocket money toys distributor. They have an established network of international trading partners and supply to many major retail outlets including; John Lewis, Fenwicks & Selfridges, Hamleys, Harrods, Amazon and of course us here at Rhubarb Toys. Trousselier Paris is France's premier maker of charming high quality toys. Their selection of rabbits, teddies and other animals are made from the finest materials and will become lifelong friends and cuddling companions. Each toy comes with a presentation box. Vilac toys are known for their classic look and feel, from their smoothly rounded, high gloss lacquered wooden vehicles, to their expansive, finely detailed puzzles. Vilac toys are timeless, with a bold durability that isn't subject to the fickle whims and ever changing fads of the day. All Vilac toys are subject to the highest levels of product scrutiny, according to regulations of the European Union, to ensure that your child's toys are as safe as they are entertaining.